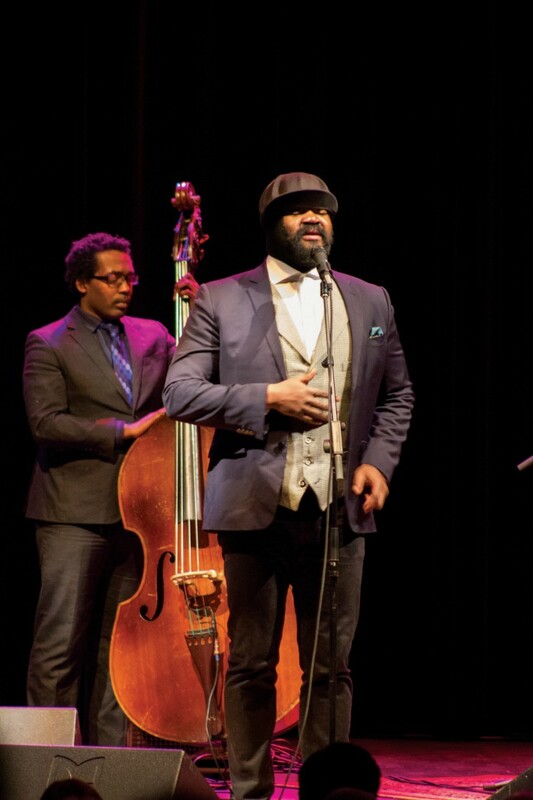 On a mild night in mid-January, the once bike-laden paths leading toward Campbell Hall filled with excited concert-goers, and the vestibule inside buzzed with excitement in anticipation of Grammy-winning Gregory Porter. If your initial reaction to that previous sentence was something like “Wait, who?,” you and I probably share the commonality of not listening to much jazz music. As it turned out, I had the privilege of seeing last year’s 2014 Grammy award-winner for Best Jazz Vocal Album, Liquid Spirit, perform at my school. Gregory Porter was born in Los Angeles, raised in Bakersfield, California, and attended San Diego State University on a football scholarship. He was nominated for two Grammy awards and won one in the mere four years since his first album, a fact which remains a mystery considering he has been singing for almost 20 years. His path to jazz speaks of hardship and savior. As a child, he sang only at the local church his mother ministered. His father was never home and pretty much nonexistent in his life. Raised watching his mother carry the burden of struggling through life’s challenges alone humbled Porter’s own personality. At around 20, with his football career splintered by shoulder injuries, Porter held his mother’s dying hands as she struggled to breathe her last breaths. One of her last words told him to try becoming a singer. Although skeptical, he gave it chance. It changed his life forever. As Porter and his band walked on stage, he received an enormous welcome from the students and local residents, lasting for what seemed like an hour. Not knowing what to expect, I can honestly say that I thoroughly enjoyed the performance from beginning to end. Jazz music is known to reinvigorate the spirit, bring people together, and channel the energy of culture, emotion, and experiences we can relate to through music. Gregory Porter and company did just that. All of his songs, including hit singles “Real Good Hands,” “Be Good,” and “On My Way to Harlem” were written by Porter in reflection of personal experiences. His majestic voice beautifully carried the emotional weight of every song. He kept the audience engaged, asking us to clap and sing along at various parts; in fact, Porter seemed just as motivated on stage as we were, moving around everywhere and proudly watching his drummer, cellist, pianist, and saxophonist nail every solo they had. As I mentioned earlier, jazz music is known to bring people together. Many people can really relate to the tune, lyrics, and feel of songs in the genre. A few audience members notoriously sang at questionable times (out of good will) and it goes to show how much of an impact jazz can have. In the end, as Porter and crew walked off stage, the crowd gave a standing ovation with encore chants that were grandly answered. Porter walked back on stage and joked “well if you never asked, I would have never known what to play!” In the closing moments, the audience gave its resounding appreciation to what was an exhilarating performance. I now know where to start my journey in jazz.